Trailer Review: “Husband, father, soldier, monster,” Adolf Eichmann was a member of the Austrian Nazi party and is sometimes referred to as “the architect of the Holocaust.” Directed by Robert W. Young, the new film, Eichmann, is based on the final confession made by Eichmann before his execution in Israel on the May 31, 1962. After World War II, Adolf Eichmann fraudulently obtains a laissez-passer travel document from the International Red Cross, which he then uses to flee to Argentina. Fifteen years later, the world’s most wanted man is eventually captured by Israeli intelligence operatives. Eichmann’s interrogations are conducted primarily by a young Israeli police officer by the name of Captain Anver Less. In the struggle to divulge the exactitude of Eichmann’s role in the Third Reich, a powerful battle of wills ensues between him and the captain–the outcome of which will profoundly affect the state of Israel. 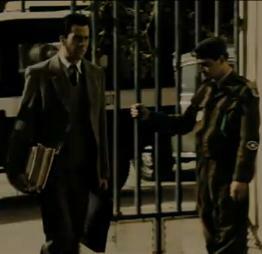 In the trailer, Eichmann’s character is firmly established as that of a super villain. It is accomplished in a way, though, that almost causes the texture of the film to feel more like a graphic novel. From the character’s costumes to the environmental backdrops, the colors that are utilized in the film are mostly grays and sepias, conveying the impression of dinginess. In the trailer, however, there are frequent, episodic punctuations of sensational text set across lurid, red stripes, which, when contrasted with the film’s drab coloring, cause the film’s melodrama to be hyperbolized, especially when paired with bold sound effects and a dramatic score. 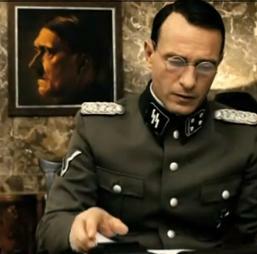 Eichmann stars Thomas Kretschmann, Troy Garity, Franka Potente and Stephen Fry. Aside from a motley mash of imprecise, foreign accents, the acting, as evinced in the trailer, appears to be very intense and stirring. Thomas Kretschmann looks especially good as the title character, playing the role of the evasive interrogatee with a chilling stoicism and just a hint of wryness. Check out the trailer for Eichmann below. What do you think? Trailer Review: From director Jon Amiel, the powerful biopic Creation is the tale of revolutionary thinker Charles Darwin and his personal struggle with science and religion preceding the 1859 publication of On the Origin of Species. The film stars real-life husband and wife team Paul Bettany and Jennifer Connelly as Charles and Emma Darwin. The primary focus of Creation is on Darwin the man, not the explosively divisive theory of evolution. The film examines Darwin’s familial struggles and the personal demons that dog his core, which involve the death of his beloved 10-year-old daughter, Annie, and the fear of becoming estranged from his deeply religious wife, Emma. In the film, the conflict of science versus religion is personalized to become husband versus wife. In effect, the divided sentiments persisting in the Darwin family circle represent a microcosm of the great evolutionary dispute. The tensions brought about by these circumstances serve as the foundation on which Creation is built. Darwin is a churchgoer who passionately loves his wife, but he also is a scientist with a mounting conviction that he lives in a world where God has no place. His spousal relationship serves as the foil that most drastically affects his readiness to unleash his discoveries. Set primarily within the confines of a small English town, Creation could be classified as a domestic melodrama. Yet, from what is evinced in the trailer, the film plays more like a fantastical, almost dream-like voyage. With breathtaking images of lush countryside, crashing waves, and jungle rivers interspersed among the plot-driving points, the trailer for Creation sweeps viewers off their feet and makes them feel as if they are about to embark upon a great, mystical adventure. Creation appears to be a compelling, heartfelt story with superb performances from both Paul Bettany and Jennifer Connelly. Bettany appears especially strong in his role as Darwin, playing the world-renowned scientist and “man who killed God” with a gentle eloquence that speaks volumes. It will be interesting to see if the film can hold up against the cinematic natural selection and garner much critical acclaim. Check out the trailer for Creation below. What do you think? Trailer Review: Winner of Best Film at France’s 2009 Cesar Awards, Séraphine is the beguiling biopic of Séraphine de Senlis, a deeply spiritual cleaning lady with an artistic aptitude reminiscent of Van Gogh – kind of a like the French, female edition of Good Will Hunting. This exquisitely crafted film stars Yolande Moreau in the title role and Ulrich Tukur as Wilhelm Uhde, the German art critic and collector who esteemed Seraphine’s savoir faire for colorful canvases. Today, with her paintings adorning the walls of some of the most famous art galleries in the world, Sérphine de Senlis is revered as a gifted artist. While working as a housekeeper at the dawn of the 20th century, however, Séraphine was regarded as a bit of an oddity by her employers and the local townsfolk. That is, until she started cleaning house for Wilhelm Uhde, the famed art collector who helped launch the careers of many notable artists, including Pablo Picasso and Henri Rousseau. Upon Uhde’s discovery of Séraphine’s visionary renderings of nature’s beauty, a touching, albeit unlikely, friendship developed between the avant-garde art collector and his cleaning lady. While Séraphine’s standing in the art-world is largely thanks to Uhde’s championing, the tumultuous events that ensued during their relationship really put the resiliency of the human spirit to the test for everyone involved. The trailer for Séraphine includes only very concise and spaced-out instances of French dialogue, with the trailer’s mid-section using almost no words at all. After Séraphine reveals with child-like mystique that she has her own little secrets, the middle portion of the trailer transports the viewer into Séraphine’s private world, relying on lighthearted images and a jaunty piano score to create a sense of rapture. The music’s tenor soon takes on a more haunting tone, however, as the dialogue returns when a nurse asks Séraphine if everything is alright in her mind. Suspended in a purgatory between the threshold of madness and the call for greatness, Moreau is excellent in the role of Séraphine, playing the part of the sensitive but tormented artist with transcendent lyricism. As a woman who is plagued by an intensely private spiritual struggle, the trailer is very effective at conveying Séraphine’s vulnerabilities with affecting simplicity, making Séraphine definitely worth a watch. 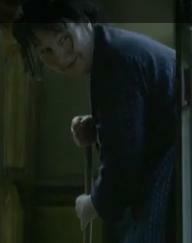 Check out the trailer for Séraphine. What do you think?